Having been invited as a participating guest to the Madách International Theatre Meeting (MITEM) for four days, I was somewhat curious about the festival program on offer in a country that has become something of a pariah in Europe. Because of Hungary’s increasingly anti-immigration and anti-Islamic policies and its (in the words of its Prime Minister) “illiberal democracy,” I found the festival at the National Theatre in Budapest to be a pleasant surprise. Named for a Hungarian artist Madach Imre, the festival, which has been running for five years, used the many spaces within and around the National Theatre for an extensive variety of 26 theatrical performances from 12 countries over two and a half weeks in April 2018. 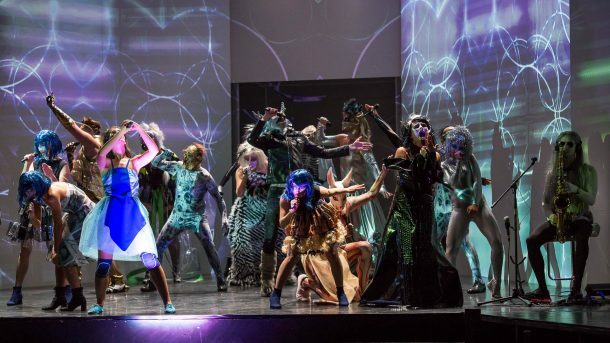 The festival is organized by the artistic director Attila Vidnyánszky, who is known for being a supporter of Prime Minister Viktor Orbán as well as being the founder of a right-wing theatre association. Coming from a Hungarian-speaking part of Ukraine where he ran a successful theatre company, Vidnyánszky developed a reputation as an innovative theatre director in the Ukraine and in the city theatre of Debrecen, before taking on the leadership of the National Theatre. At the helm of the National Theatre, as the head of an acting school, as the founder and head of a theatre association, as well as running the festival, Vidnyánszky has a lot on his plate and undoubtedly many critics. Apparently, a meeting at the Goethe Institute during an earlier MITEM festival in 2015 took him to task for conservative programming and his close association with the Fidesz government, but for this year’s festival it seemed that Vidnyánszky considered some of that criticism. 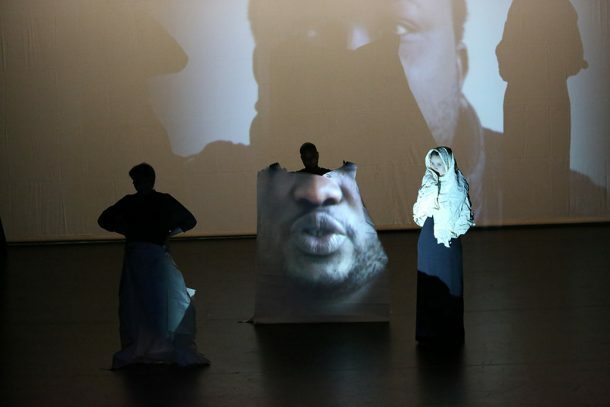 For the first time in the festival there was a series of Arab-themed productions that related to the Middle East conflict and indirectly to the needs of refugees that Orban’s government has denied. As I was able to attend only five performances during the festival, it was reassuring for me to see the work of Ali Chahrour’s company from Lebanon, as well as Mokhallad Rasem’s work with the Toneelhuis of Antwerp amongst them. Chahrour is an extraordinary dancer, and his May He Rise and Smell Fragrance is a one-hour movement and music piece dealing with war and sacrifice. Three male performers arise from the front row and stare at the audience with the increasing sound of helicopters approaching and surtitles projected asking about the possibility of resurrection. The piece then develops with the appearance of a female figure representing a grieving mother who sings traditional as well as newly composed dirges over Chahrour, representing her dead son, presumably killed in a Middle Eastern war. The other two male actors provide the music and percussion, accompanying and physically joining in the dance movement. Eventually May He Rise and Smell Fragrance focuses on the resurrection of the dead man as the grieving mother transforms into a divine bare-breasted figure (representing the goddess Ashtad), who impels the inert Chahrour to come to life with extraordinary pulsations of his body. The resurrection process blurs Mesopotamian mythology with Christian imagery, with Chahrour appearing as a Christ-like figure. 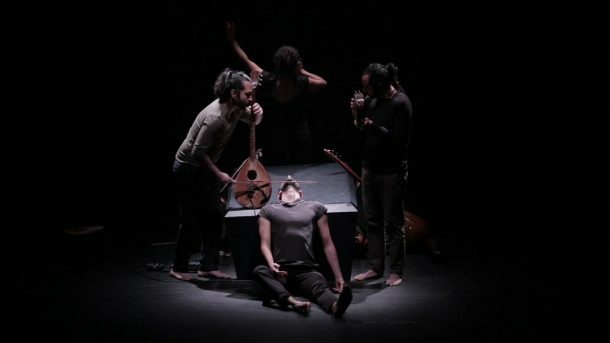 While somewhat long-winded with extended sequences of singing and repetitive movement, the performance placed the Middle East conflict firmly in the festival. Body Revolution by Toneelhui Antwerp. Another Arab-inspired performance, directed by the Iraqi director Mokhallad Rasem for the Toneelhuis Antwerp, consisted of two short pieces Body Revolution and Waiting. The first of these pieces used white drapes on which were projected buildings in ruins from the warn-torn Middle East. In an extraordinary sequence, bodies emerge from the ruins, like ghosts from the war in Syria. As these images and ghost-like figures continue to merge with the backdrops, the piece becomes somewhat repetitive. Waiting, by Toneelhui Antwerp. Photo: Vincent Canby. In the second piece Waiting, the actors carry white sheets of fabric, which they move around the stage, creating different configurations on which are projected interviews with random people commenting on what it means for them to wait. For some, waiting is a waste of time, for others it is a time for reflection. Gradually the main theme of the piece emerges with certain interviewees revealing that waiting for them means waiting for the correct papers. Thus the piece comments on the urgent problem for migrants and refugees from the Middle East and Africa wasting their lives waiting for the correct papers to live in Europe. Although commendably tackling an important theme, Waiting unfortunately became quite tedious with the same formula of interviewees repeating what waiting means for them, though perhaps that was the aim of the piece. Other productions that I saw in the MITEM were: Ostrovsky’s The Storm by the Bolshoi St Petersburg Theatre; Tsesho – What’s That? 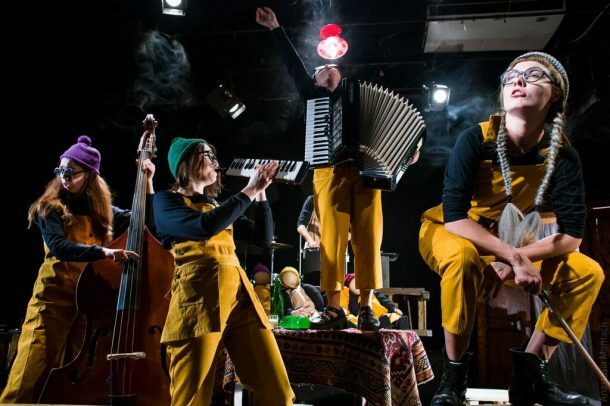 Puppet Cabaret which was co-produced by CCA “Dakh” and Teatr-Pralnia from Kiev; and Clowns 2 ½, directed by Roberto Ciulli of the Theater an der Ruhr in Mülheim. The Storm employed direct address by the actors, who were rolled toward the audience on platforms when it was their turn to perform. Unfortunately, for me this repetitive pattern became tedious because the play was in Russian with Hungarian titles, and not being so familiar with The Storm. After the first half, lasting ninety minutes, I escaped to the unseasonably warm Budapest air and the lovely view of the Danube. Tsesho – What’s That? Puppet Cabaret. Photo: Teatr Pralina. Tsesho – What’s That? was presented by an energetic group of young Ukrainians (five women and one man) of the “Dakh” & Teatr-Pralnia/Laundry Theatre, Kiev, directed by Vlad Troitsky. All of the performers act, sing, and play instruments, and occasionally operate puppets. Sung and spoken in English and Ukrainian, with Hungarian and English surtitles, the piece began as a reflection on bored teenagers who pass their time telephoning and sending text messages to one another. But the story gathered momentum as war in the Ukraine erupted and took over their lives, with their dialogue changing from vapid clichés to more urgent expressions of angst. The piece I enjoyed the most was Clowns 2½ directed by Roberto Ciulli of Theatre an der Ruhr. 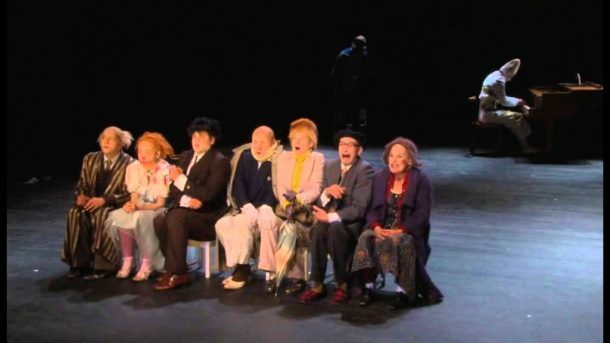 About ten comic figures gradually entered the stage, presenting strongly contrasting character types: a tired old man, a camp overweight hedonist, a grand dame, etc. They carried out a variety of routines that were aided by a piano player in masked Pierrot costume, and a hospital orderly who interrupted their actions. The piece resembled an outlandish ward in an old people’s home or psychiatric hospital, where the inmates take on outrageous behaviors only to be curtailed by the warden. Clowns 2 1/2. Photo: Teatr an der Ruhr. In addition to these pieces, there was an impressive variety of shows from diverse countries, including Estonia, Russia, Ukraine, Hungary, Germany, and Lebanon. The festival included many notable directors and companies such as the Berliner Ensemble, with the impressive staging by their new artistic director, Oliver Reese, of a one-man performance based on Günter Grass’s novel, The Tin Drum. Other performances included the Piccolo Theatre of Milan’s production of Pinocchio, Valery Fokin’s production from the Alexandrinsky Theatre in St Petersburg of ŠveJk. The Return, and Michael Thalheimer’s Berliner Ensemble production of Brecht’s Caucasian Chalk Circle. The Hungarian theatre was represented by Attila Vidnyánsky’s production of the old warhorse from the Hungarian nationalist era, Katona’s Bank Ban, and László Bocsárdi production of Alice (based on Lewis Carroll’s Alice in Wonderland). I also regretted missing the work by Theater an der Ruhr’s Collective Ma-louba, and Nekrosius’s production of Chekhov’s Ivanov. The National Theatre of Budapest is an extraordinary theatre building. Opened in 2002, it combines nineteenth century interior design (including boxes in the main theatre), with a postmodern pastiche of sculptures and submerged ruins of a theatre building on the outside. It is located picturesquely on the bank of the Danube, looking back at Gellert Hill and Buda Castle. One hopes that the festival will continue to flourish and to offer a welcome to theatres from all regions, ethnicities and religious orientations. 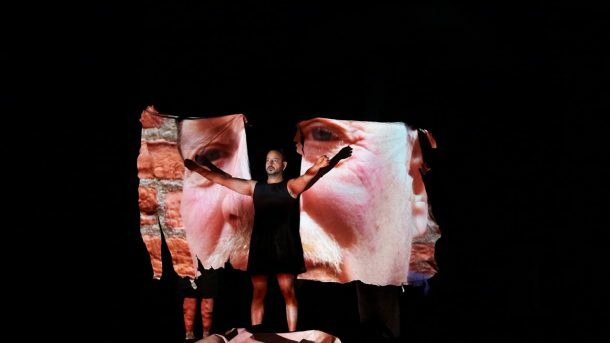 The theme of the festival, “I was born to share love not hate,” clashes somewhat ironically with Hungary’s recent policies of closing its borders to refugees, with the leading Hungarian theatre director Arpád Shilling’s emigration to Paris, and with Orban’s fear-inducing, anti-immigration rhetoric. The Minister of Human Resources, Zoltán Balog, welcomed visitors to the festival at the beginning of the printed program by calling Hungary “a nation whose solitary language is refuge and isolation in equal measure.” Hopefully the emphasis on refuge will increase in the future. Dmitry Danilov’s A Man from Podolsk. Photo: Wilam Horzyca Theatre. 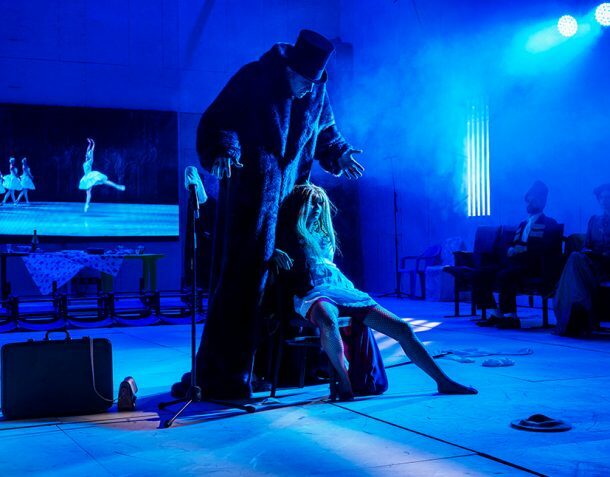 Having attended the MITEM festival at the National Theatre in Budapest in April I was a bit apprehensive about attending a second theatre festival in another somewhat pariah state in the following month. Poland, like Hungary, has irritated the European Union because of its rejection of a proposal coming from Poland’s former prime minister and current President of the European Council, Donald Tusk, that all EU states should share the burden of refugees coming from the Middle East. Moreover, like the “illiberal democracy” of Hungary’s Viktor Orban, Poland has introduced new anti-democratic policies, such as its recent overhaul of the judiciary. As Torun is the home of the right-wing radio station Radio Maryja, I feared that the Kontakt Festival there might show the effect of their influence. Fortunately, the Festival, as far as I could tell, had neither been noticeably affected by governmental policies nor by the presence of the right-wing Catholic media. Despite certain visiting theatre artists to Poland being recently subjected to forms of governmental interference (as well as accusations of blasphemy from religious authorities), such as Romeo Castellucci (because of his production On the Concept of the Face, Regarding the Son of God) and Oliver Frljic (because of his production of Curse with its depiction of Pope John Paul II as “protector of paedophiles”), the Kontakt festival proceeded smoothly with thirteen performances in a sunny week in May. A particular treat of the visit was to discover the beautiful thirteenth-century city of Torun, a UNESCO site with its extraordinary Old Town and New Town both dating from the fourteenth and fifteenth centuries, and many of its buildings carefully preserved. The well-maintained gothic architecture, with terraced houses that seem to have been given eighteenth century face-lifts and more recent renovation in pastel shades of colour, provides a cozy backdrop for the walking precinct, with cafes flowing into the street and thousands of children on school trips providing animated enthusiasm. As the birthplace of Copernicus, whose statue next to the town hall in the centre of the Old Town is a favourite meeting point, and lying on the border between Prussia and Russia after Poland disappeared as a nation-state at the end of the eighteenth century, Torun provides a historical setting for its annual theatre festival. 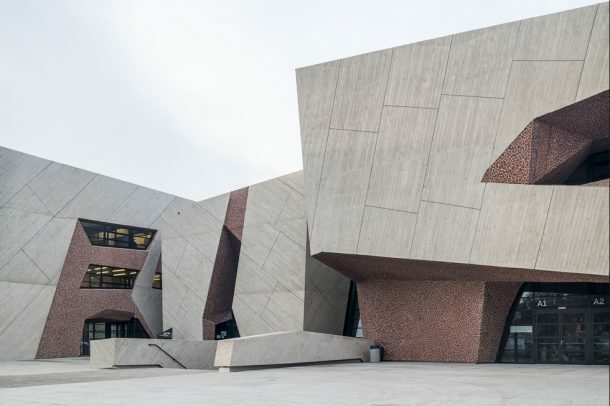 CKK Jordanki Concert Hall, designed by Fernando Menis. Photo: Wilam Horzyca Theatre. The Kontakt theatre festival is regarded as one of the most prestigious theatre festivals in Poland. It was predated by a local theatre festival in Torun (the North Polish Theatres Festival) from 1959 to 1989. In 1990 Krystyna Meissner organised an international dimension with four productions of Jonas Vaitkus by the Vilnius Drama Theatre, and in the following year she developed Kontakt as an international festival to bring together “the East and the West”. Since then, it has successfully showcased many of the leading theatre productions from Western and Eastern Europe. Such luminary directors as Arpad Shilling, Peter Brook, Peter Stein, Thomas Ostermeier, Frank Castorf, Eimuntas Nekrosius, Oskaras Korsunovas, Rimas Tuminas, Alvis Hermanis, Luk Perceval, Sasha Waltz, and Christoph Marthaler have all staged their work in the Torun festival. More diverse works have come from Madagascar, Tunisia, Turkmenistan, Tajikistan, Vietnam, South Korea, China, and Australian aborigines. Recalling its original purpose, this year’s festival was again titled “From East to West”. A theatre journal in Polish launched during the festival highlighted the work of the festival over almost thirty years. Without a Dowry. Photo: Wilam Horzyca Theatre. As I was visiting the festival for three days, I was able to see only five of the thirteen productions. Of these the most outstanding and for me the most enjoyable was a Russian performance of Ostrovsky’s play Without a Dowry, directed by Dmitry Krymov. Unlike most of the productions in the festival that were performed in one of the two stages of the Wilam Horzyca Theatre, Without a Dowry was presented in the newly opened Concert Hall (CKK Jordanki) designed by Fernando Menis, which looks somewhat like a Daniel Libeskind structure because of its oddly carved-out holes in the sides of the building. It has an enormous stage and the performance lined one side with a coat rack that kept (deliberately) collapsing. 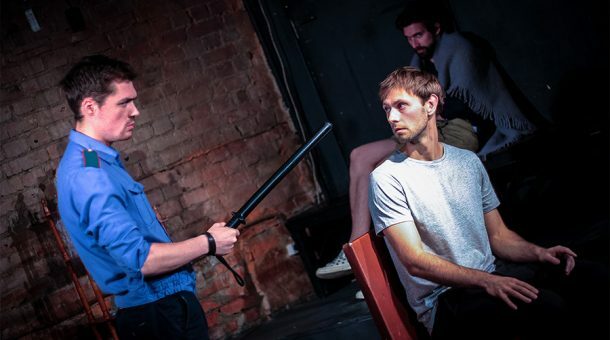 The performance, which lasted almost three hours, used a cinematic backdrop that the characters sometimes sat and faced as if watching their own lives played out in a cheap Russian cinema. The characters appeared on the screen in the distance, gradually approached and then entered at the back of the stage and into the onstage action of the drama (or retreated by the same route). For much of the play, the movie screen depicted a seafront, in which the characters made their appearance and a ship emerged on the horizon, gradually becoming larger as it delivered the protagonist, Paratov, to disrupt Larisa’s wedding. But this view was occasionally interrupted by the irrelevant transmission of a Russian-Netherlands football match on the screen, which the characters also observed. Maria Smolnikova, as Larisa, the bride-to-be, displayed extraordinary versatility, both in terms of her emotional range and in her performative skills, and she was ably matched by Georgy Tokaev as her lover Paratov, who disrupts her marriage to her awkward fiancé, Karandyshev (Maksim Maminov). In a very funny scene, Paratov tries to meet with Larisa, but is continually prevented by Larisa’s mother played by a man in drag (Sergey Melkonyan), who physically tackles him, and repeatedly drags him to the floor. The end of the play was both shocking and predictable in its execution. Both Krymov and Smolnikova were deservedly awarded prizes for best director and best female actor. Tango. Photo: Wilam Horzyca Theatre. Other plays that I saw included Reykjavik ’74, a documentary inquiry into an apparently historic murder in Iceland that is meticulously dissected by a local production of the Wilam Horcyca Theatre; Dmitry Danilov’s A Man from Podolsk, concerning a man who is arbitrarily arrested and interrogated, staged by Theatre.doc from Moscow; Mrozek’s Tango also performed by the Wilam Horzyca Theatre, about a reversal in social norms; and The Marusya, a one-woman show by Kostroma from Russia about a theatre administrator turned non-dancer. Two of these – Reykjavik ‘74 and A Man from Podolsk – dealt with extensive police investigations. The most interesting of these, winning a special award for the ensemble, was A Man from Podolsk directed by Mickhail Ugarov in which various characters interrogate a man from an ordinary suburb Moscow who does not seem to have done anything wrong but expects to be tortured. Instead the various officers play verbal games with him, get him to act out silly moves, and try to convince him that his drab Moscow suburb is a thing of beauty. At the end of a long interview, they conclude, as they release him, that they will look forward to arresting him again. 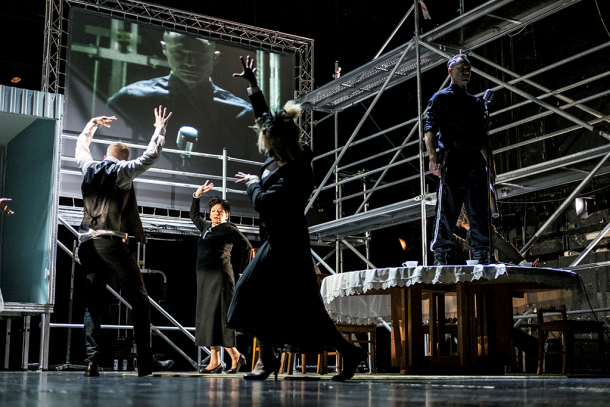 Mrozek’s Tango, about the younger generation wanting to revert to conventional norms that the older generation has abandoned, added a political edge towards the end of the play with the oppressive social figures being represented by priests and menacing black shirts that hinted at recent anti-democratic developments in Poland. Other performances in the festival that I was unable to see included Alain Platel’s Requiem for L by C de la B, with music by Fabrizio Cassol, that won the Grand Prix for the best performance and best music (merging African popular music with Mozart’s Requiem); Sibylle Berg’s After Us – Outer Space, directed by Sebastian Nübling of the Maxim Gorki Theatre; and Medea staged by the Mikhail Chekhov Riga Russian Theatre. Steve Wilmer is Professor Emeritus in Drama and former Head of the School of Drama, Film and Music at Trinity College Dublin, and has been a Visiting Professor at Stanford University and UC Berkeley and a Research Fellow at the International Research Centre for Interweaving Performance Cultures at the Freie Universität, Berlin. He is the current editor of Nordic Theatre Studies and his most recent book is Performing Statelessness in Europe (Palgrave Macmillan, 2018).